Dare to be bold with colors people! I was sitting at a small market recently, when a family came to my table and looked at the items I have for sale. I had to comment on their beautiful perambulator top because the colours where so vivid and I’ve never seen anything like it before. It just lit up the room when they came in and this made me so happy. 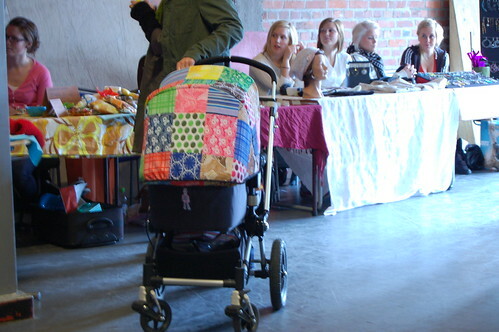 The squares where all colourful vintage fabric with fun patterns. It was made by the baby’s father (!) and this day was their first walk with the top on. Imagine if more people would use colour in this way, how much happier and brighter the world would be. Dare to be bold people; use colours, patterns, strange combinations! I bet this pram will get lots of comments and make a lot of people smile. I just had to snap a photo to share with you crafty girls. Isn’t this craft used when at its best? 9 Responses to Dare to be bold with colors people! What a wonderful idea… I love it! ?h, bara att se barnvagnen p? foto gjorde mig glad! Tack f?r en glimt av f?rg, gl?dje och inspiration – den var verkligen underbar! How pretty! People around here mostly use strollers these days — it’s super rare to see a baby carriage like that, but I think they’re so cool. S? flott barnevogn, helt enig i at farger gj?r oss gladere! Godt ? h?re at du f?ler deg litt bedre. Jajam?n det d?r var det coolaste jag sett p? l?nge! Varf?r har ingen t?nkt p? det d?r tidigare? Hur naturligt och ?rligt som helst, ideen kommer nog direkt fr?n hj?rtat… Vi kan bara st? brevid och inspireras! Vad roligt att du ?r tillbaka och grattis till utbildningen, jag tycker mycket om dina inl?gg! Gorgeous! I agree, we need more colour around! My computer crashed a month ago, now I have a new one, and I just discovered that you’re back blogging! I’m so glad! No blog inspires me as much as yours, keep up the good work. You don’t know me, but I admire you and the things you create. Oh, I totally agree! How bright and cheery it looks!